With the development of technology, the camera of Samsung Galaxy series is getting better and better. The latest S9 even is equipped with adjustable apertures, which supports to seamlessly shift between f/2.4 and f/1.5 to provide perfect optics for both day and night. As a Samsung fan, you must have taken a mass of fantastic photos with your Galaxy phone, right? However, photos take up large internal storage, so you have to transfer your photos to computer to free up space. 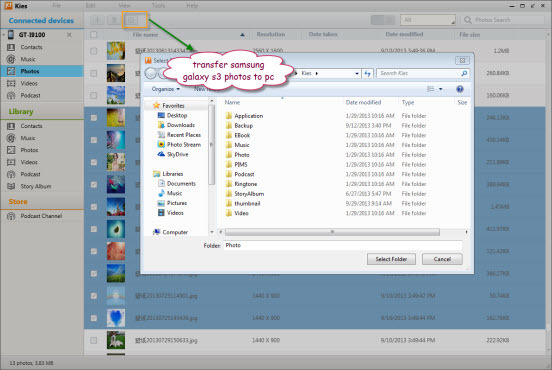 Next, this post will share three simple ways to transfer photos from Samsung Galaxy phone to PC. 1. Connect the Galaxy phone to computer using USB cable. On the phone’s screen, a message will appear to inform you that you have connected to the computer. 2. Select “MTP” connection mode. 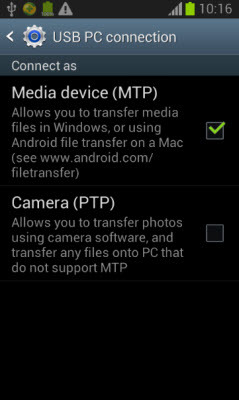 From the Notification panel, tap “USB Connection” alert and select the option “Media device (MTP)” to use Windows Explorer to manually transfer media files between your phone and the computer. 3. Move Samsung Galaxy Pictures to PC. After successfully connected to computer, your Galaxy phone should automatically pop up in “Computer” section. Browse the “DCIM” folder to drag and drop your camera photos to a specific folder on your computer. Note: This method is easy but risky, because there is a chance that your photos will get corrupted after dropped to computer due to connection problem and other reasons. 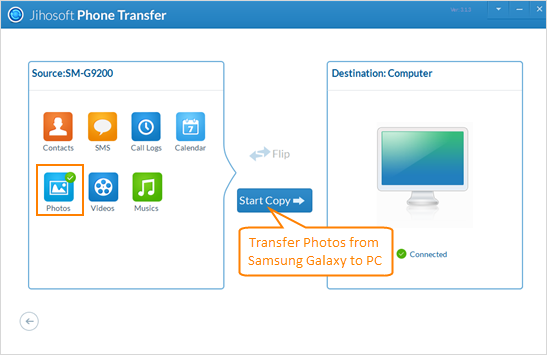 Jihosoft Phone Transfer is a wonderful tool that can backup photos, contacts, music, videos, etc from your Samsung Galaxy phone to PC and restore the backup to your phone with a few clicks. Moreover, it is guaranteed to complete the Samsung backup and restore without any risk. 1. Run Jihosoft Phone Transfer on PC. From the homepage, click “Backup Your Phone” at the bottom right to enter the backup window. 2. Connect Samsung Galaxy to PC via USB cable. Now insert your Samsung Galaxy phone to the computer via USB cable. The program will automatically detect the device and display it as the “Source”. 3. Transfer Pictures from Samsung Galaxy to Computer. Check “Photos” in the listed file types and tap on “Start Copy”. Then choose the backup location, and your Samsung galaxy photos will be quickly copied to computer. Kies is an official computer software released by Samsung company to help Samsung phone users to sync data between different devices. 1. Enable USB Debugging Mode on Samsung Galaxy. Enable USB debugging mode on your Samsung Galaxy phone, then connect it to the computer using the included USB cable. 2. Connect Samsung Galaxy Phone to Kies. Open Kies on your PC, the program will automatically connect your phone with it. After connected, the main information of your phone will appear in the main screen of Kies. 3. Transfer Photos from Samsung Galaxy to PC. Click the “Photos” option in the left-hand column, then all the photos on your phone will display in thumbnail in the right-hand column by file name, resolution, date modified and file size. Check the photos you want to transfer to computer, then hit the “Save” icon to transfer photos.